Hello friends! 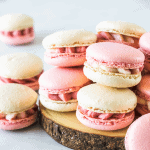 Today I am bringing another Macaron recipe! These are my beautiful and delicate Strawberry Macarons! 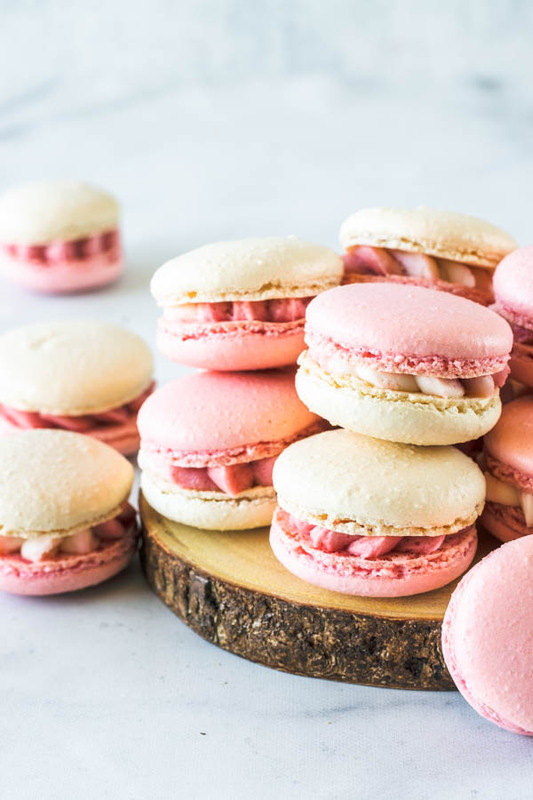 I actually made a video about how to make these macarons. 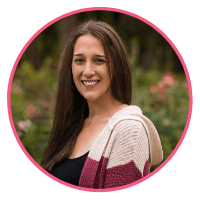 If you follow my blog, you will know I have just gotten into making videos of my recipes. I made one for my Strawberry Cupcakes, one for my Chocolate Strawberry Cupcakes, and one for my Peanut Butter Chocolate Cake. Yes, the videos are pretty basic and I need to learn how to frame my subject a little bit better with the camera. But I guess everyone must get started somewhere. 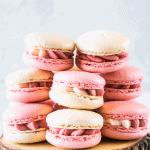 I will post the video of how I made my Strawberry Macarons here soon, when I am done editing it. It takes me hours to edit the videos, and I completely lose myself in the flow, because I am finding that I really love editing videos! 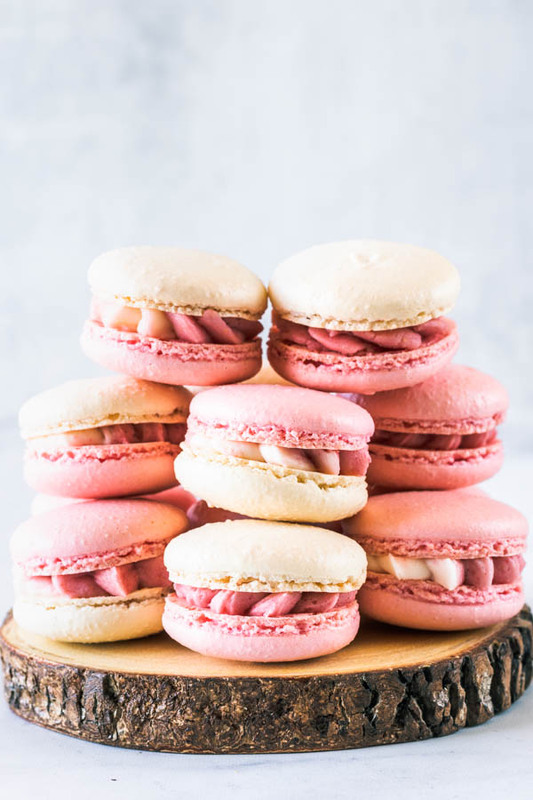 I am also currently working on another project, it’s a Macaron e-book, where I want to teach people all the tips and tricks I know of how to make macarons. And that’s also the reason why I am starting to make videos, because just explaining here in my blog is not enough for me sometimes. I want to actually show you what the batter is supposed to feel and look like, and videos are the best way to do it. So stay with me while I go through all this learning, so maybe I can be of better service to YOUR learning. I made these in two different colors, but you can make them all the same color if you want to. Same thing with the frosting. I made a swirled frosting, but you can make just one color frosting if you would like. 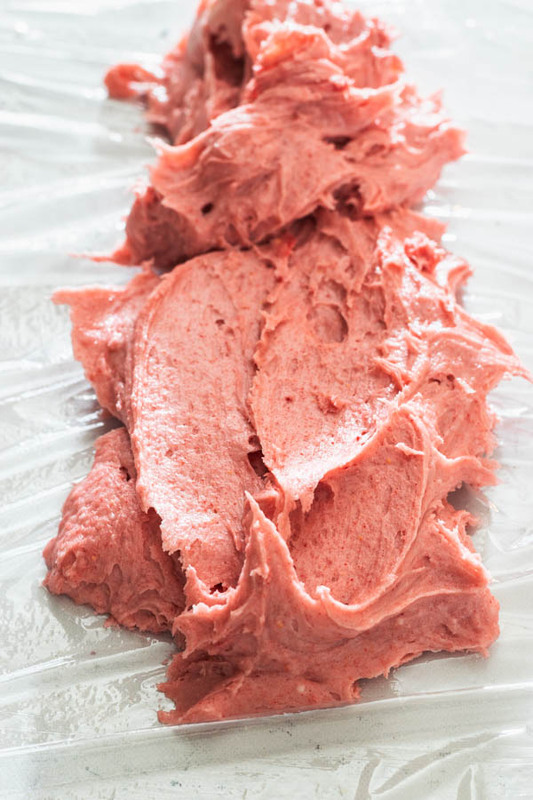 If you wish to make the swirled frosting, simply divide the frosting between two bowls before adding the powdered freeze dried strawberries to it. Add the powder only to the one bowl. Then, lay a piece of plastic wrap on the counter. Spread the strawberry frosting on top. And then top it off with the white frosting. Roll the plastic wrap over so it can be turned into a log. Insert it in the piping bag, fitted with your tip of choice. And you are ready to pipe away. I use the swirl frosting technique quite a bit, as you can see on my Pomegranate Cupcakes, Alfajor Cupcakes, Chocolate Pumpkin Cupcakes, Strawberry Lemonade Cupcakes, and Blueberry Macarons. I guess you can say I’m a fan of the swirl frosting. 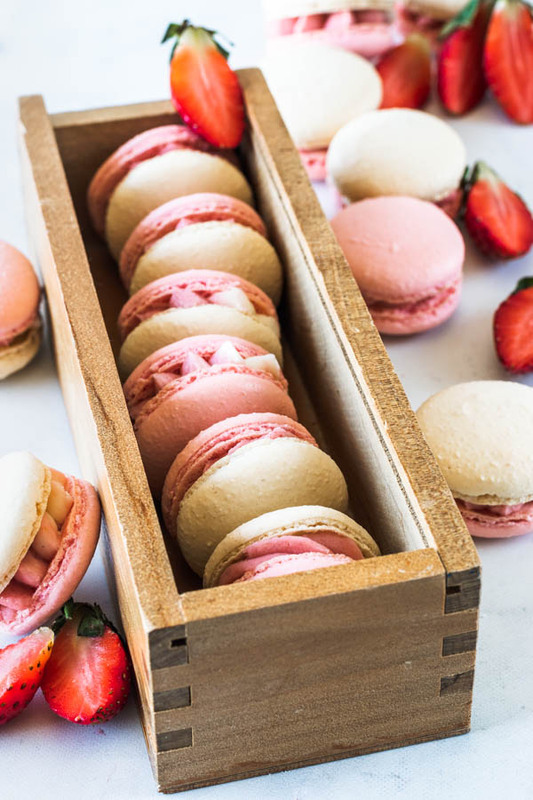 I am also a fan of these Strawberry Macarons, that were not just pretty to look at, but delicious to taste too. Probably because I love all things strawberry in the world, so how would I not love one of my favorite cookies in the strawberry flavor, right? And even though it’s winter time, I am all about baking with strawberries, since they are so delicious and readily available at the stores. I do love seasonal food, but couldn’t wait for strawberries any longer. Plus Valentine’s Day is right around the corner, and strawberries are super romantic. 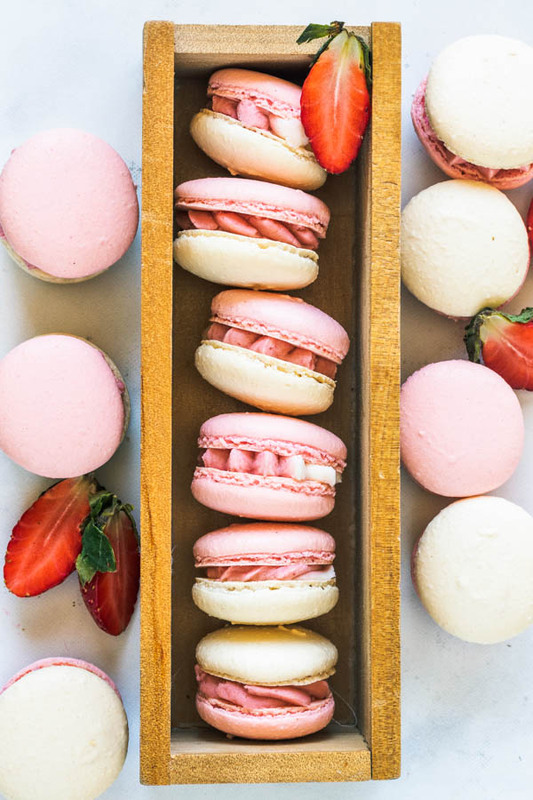 These could even be Valentine’s Day macarons! How about that! 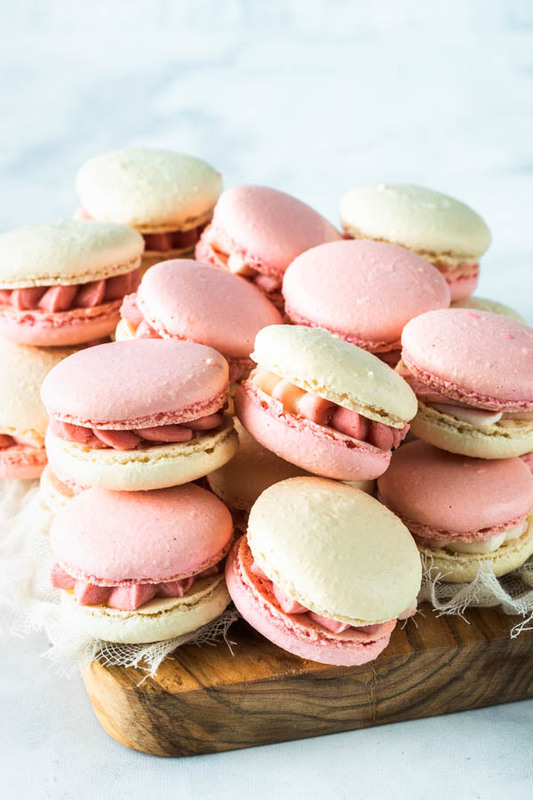 I hope you try my Strawberry Macarons, and hopefully I can show you how to make them in the videos soon! Also, remember I have many other macaron recipes on my blog. 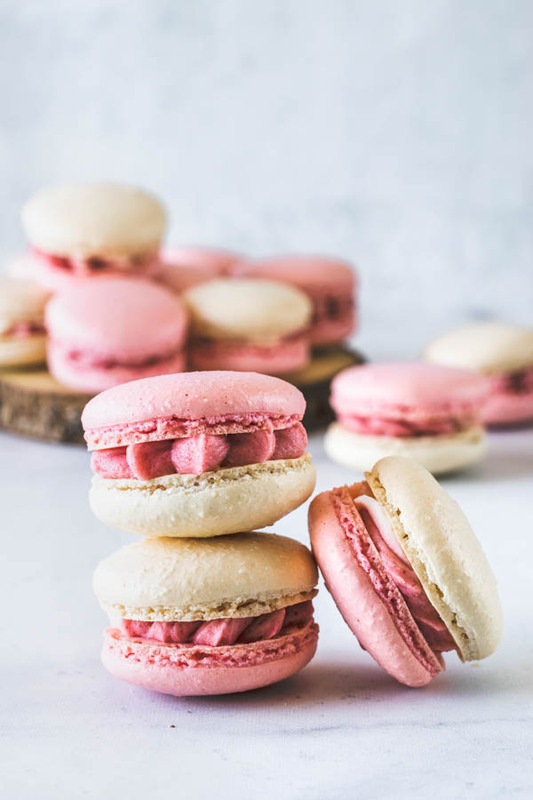 Just click here to see more Macaron flavors. Any questions and comments, don’t hesitate to contact me. You can leave a comment here, reach out on Instagram, or send me an email at camila@piesandtacos.com. I hope you have a great day and big thanks for being here and reading my blog. 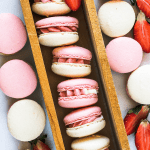 Hope you loved my Strawberry Macarons as much as I loved making them. Transfer mixture to the bowl of a stand mixer. If you want to make the shells into two different colors, I advise to split the batter into two bowls before the batter reaches the point of being ready. Because once you add the food coloring, you will have to fold more to incorporate the food coloring, and you don’t want to overmix the batter at this point. Pulse freeze dried strawberries in processor until they are a fine powder. If you are using the freeze dried strawberry powder, skip this step. Sift freeze dried strawberries and powdered sugar together. Set aside. 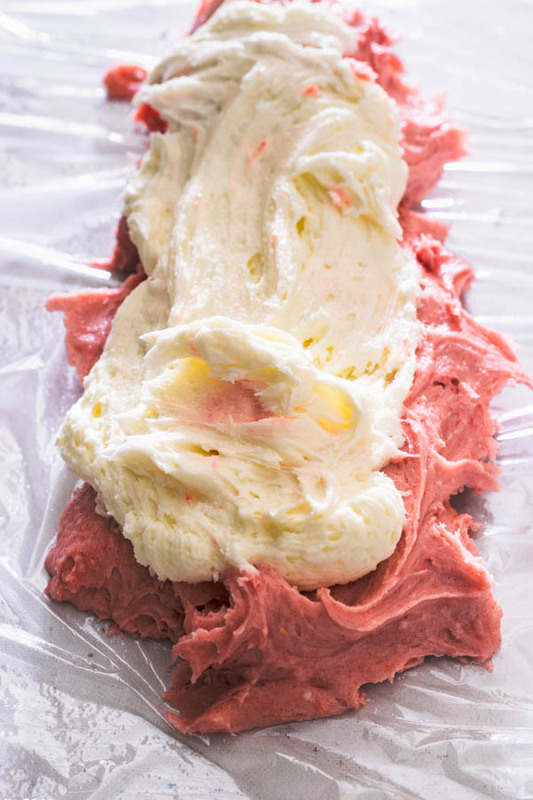 Cream cream cheese and butter for 3 minutes until smooth and fluffy. Add sifted powdered sugar and strawberry, mix on low until mixed in. Turn speed to medium and beat for a couple minutes. Add vanilla. Cream until well combined, scraping the bottom of the bowl. Place frosting in a bag lined with your favorite tip. If you want to make the swirled frosting, simply split the frosting between two bowls and just add the freeze dried strawberries to one of the bowls, instead of sifting the strawberries with the powdered sugar. Lay a piece of plastic wrap on the counter. Spread the strawberry frosting on top. And then top it off with the white frosting. Roll the plastic wrap over so it can be turned into a log. Insert it in the piping bag, fitted with your tip of choice. And you are ready to pipe away. Pipe some of the buttercream on top of a macaron shell and top it with another shell. 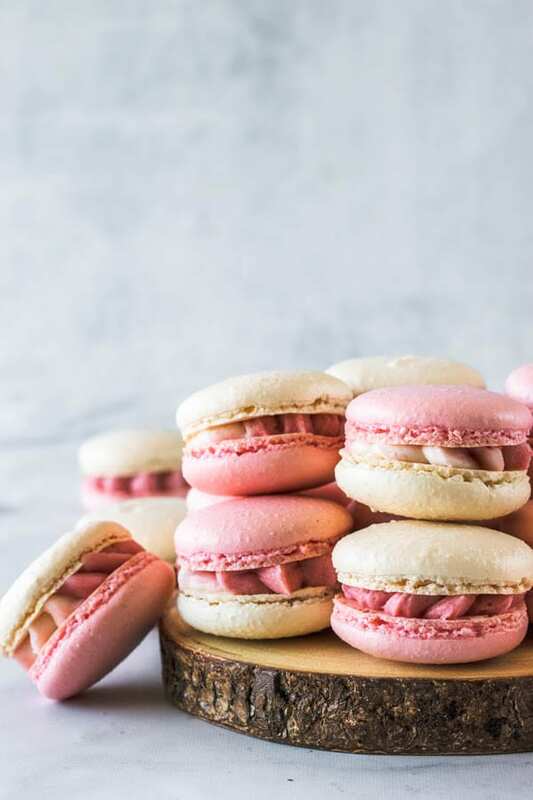 Store macarons in the fridge for up to 5 days, and in the freezer for up to 2 months, in an airtight container. Esses Macarons estão fantásticos, incríveis!!!! 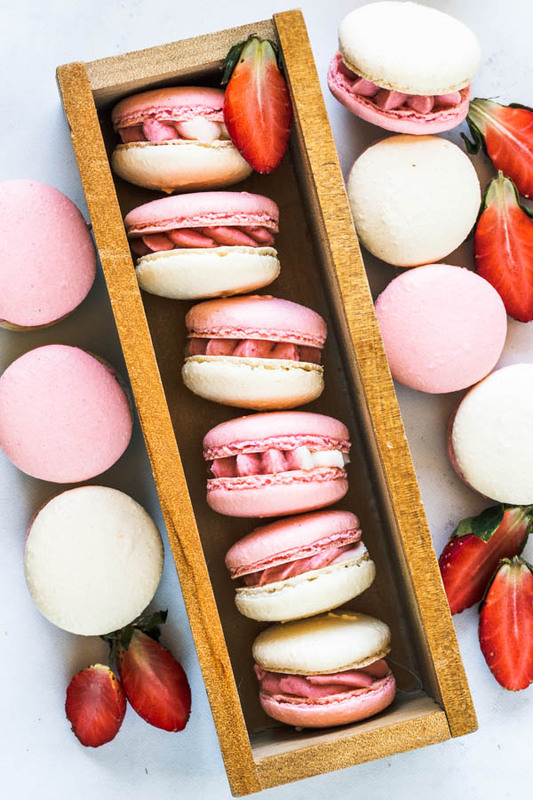 Those macarons would be perfect for Valentine’s Day! But, I am certain, you already have some tricks up your creative sleeves. Thank you for your daily inspiration Camila! Thank you for being so sweet Gina!! !